(23254.16, Barbara Cox Collection, OHS). Located between Commerce and Picher in Ottawa County on County Road E0030, Cardin began in 1913 as a boisterous mining town by the name of Tar River. The surrounding region had numerous lead and zinc mines. The town had eighteen to twenty grocery stores in addition to rooming houses, drug stores, livery stables, banks, lumberyards, theaters, speakeasies, pool halls, gambling dens, and dance halls. Although there was law enforcement and a jail, the town was besieged by vice and reportedly tolerated graft that percolated up to county offices. A newspaper editor with a nickname of "Rounder" published the Anti-Hijaker, which he used to expose many of the corrupt public servants. In June 1918 William Oscar Cardin, a Quapaw Indian, with his wife, Isa Wade Cardin, had his forty-acre allotment surveyed, platted, filed, and recorded with the county clerk of Ottawa County. The original town plat also encompassed one thousand additional acres that were found to be restricted allotments and were deannexed in 1923. 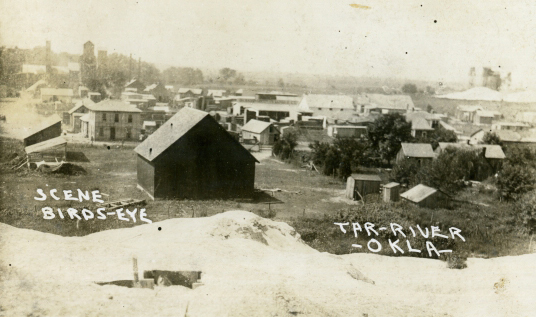 In 1920 the name changed officially from Tar River to Cardin. At that time its population registered 2,640. By 1930 the number of residents had declined to 437. In 1938 the town disincorporated. In 1983 in order to obtain grants and loans from the federal government for the purpose of building a sewer lagoon and new water lines, Cardin reincorporated. At the beginning of the twenty-first century it served as a quiet "bedroom" community with one beauty shop and four churches. The 2000 population stood at 150 residents. Cardin is located in the Tar Creek Superfund site. The city was officially closed in 2009; in 2008-2010 the federal government's Lead-impacted Communities Relocation Assistance Trust completed a buyout of property. The U.S. Census of 2010 counted a population of 3 (three) in the former town of Cardin. Daily Oklahoman (Oklahoma City), 6 September 1925. Velma Neiberding, History of Ottawa County (Miami, Okla.: Walsworth Publishing Co., 1983). Sheila Stogsdill, "Cardin Population Drops to 0 as Buyout Completed," Tulsa (Oklahoma) World, November 17, 2010. Tulsa (Oklahoma) World, 12 March 1967. Herman McMullin, "Cardin," The Encyclopedia of Oklahoma History and Culture, https://www.okhistory.org/publications/enc/entry.php?entry=CA054.